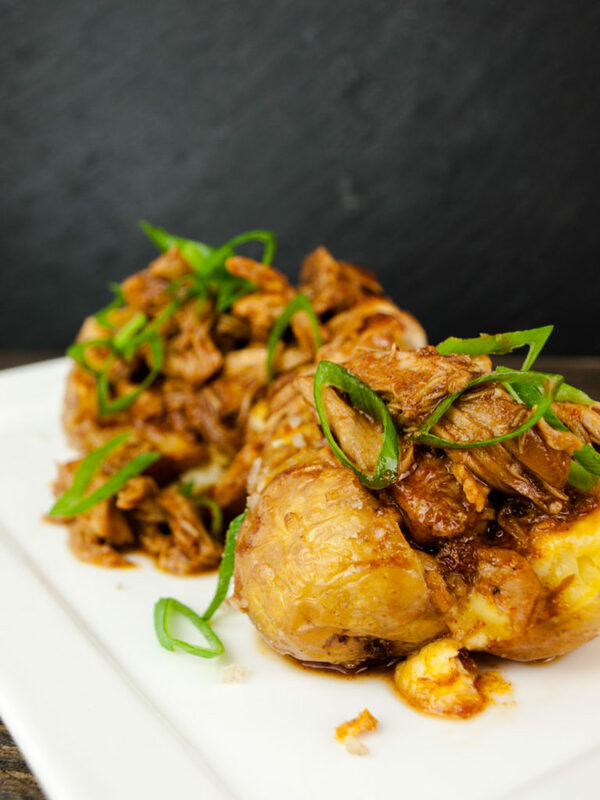 Try this tender BBQ beer pulled chicken on fluffy oven-roasted potatoes! This recipe takes some time, but is basically just prepping and waiting. You can make this delicious chicken in a pot or a slow cooker. Yes you hear right, slow cookers aren’t just for your granny anymore! It’s a really easy way to get beautiful tender meat from cheap cuts and without having a care in the world. Do other stuff and entertain your guests! 200ml of your favorite beer, simply drink the rest of the bottle! Heat a large heavy pot over medium-high heat, add a bit of olive oil and add chicken and everything except the barbecue sauce and beer. Season with salt and pepper and sear the chicken until colored on all sites. Add the barbecue sauce and beer, stir, cover and simmer for 2-3 hours. Stir from time to time, add beer if the sauce gets too thin. Taste and add barbecue sauce, salt or pepper if needed. Mix all ingredients for the chicken, season with salt and pepper, stir, cover and cook on low for 7-8 hours. Taste and add barbecue sauce, salt or pepper if needed. Preheat an oven to 190°c (fan works best). Wash and scrub potatoes. Dry afterwards. Poke each potato a few times with a fork on all sides to make them cook more evenly. Put the olive oil with the salt in a small bowl. Roll potatoes in the salty oil so all sides are covered. Bake potatoes in the oven for about 60 minutes. Once cooked, press the sites of the potatoes so they burst open. Arrange pulled chicken on top of the roasted potatoes and serve with a smile! If you want to impress your guest even more, make your baked potatoes cheesy and gooey! Get the potatoes out of the oven after 45 minutes. Mix 100g of crème fraiche with 150g shredded cheese, season with salt and pepper. Break the potatoes open and top with the cheese-mixture. Return the potatoes to the oven for the last 15 minutes. So excited you have slowcooker recipes! We love ours! Have you tried ‘chicken cola?’ Will make the kasekuchen today also! +Thanks so much for subscribing as well! !